Look for more of Steve Waithe in our May/June 2015 issue. A few short years ago, Steve Waithe couldn’t have imagined his future. If anything, his future wasn’t something he thought much about. Waithe is hardly the only 15- or 16-year-old kid who lacked motivation, but when he finally found it, it was almost too late. In his final two years of high school, Waithe realized he had the potential to be good—maybe even great—in the long and triple jumps. He quickly became one of the best prep jumpers in the nation, but having dug himself into a hole academically, he couldn’t get his grades up in time to qualify for a Division I college. When he landed at Shippensburg University, it was with a very different mindset. And a plan. 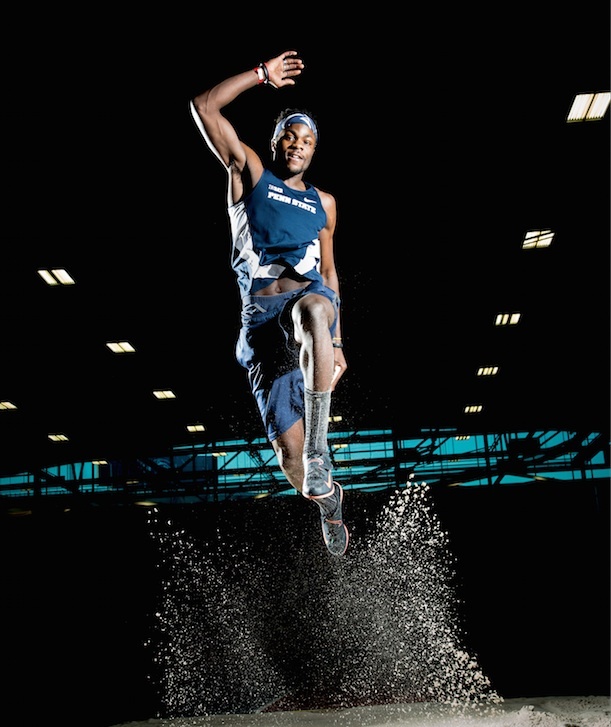 Waithe spent a year and a half at Ship, where he set school records in the triple jump and earned DII All-America honors. While there, he also competed in the Junior World Championships for Trinidad & Tobago, where his parents and two older brothers were born. Both experiences were launch pads to bigger dreams: A transfer to Penn State, with its world-class facilities and coaches, and a chance to represent the nation of his roots at the Olympics. With his academics in order, Waithe adapted to the higher DI competition in no time, winning the Big Ten outdoor title last spring in the triple jump, his top event, and placing fourth in long jump for good measure. He posted top-six finishes in the triple at the NCAA indoor and outdoor championships, earning All-America status in both events. He’s aiming for more of the same this spring. Entry filed under: The Penn Stater Magazine. Tags: From The Magazine, May/June 2015, Steve Waithe.